Are we getting even closer to finding a new cosmic home away from home? In 2010, an Earth-like planet called Gliese 581g was discovered just 20 light years from our home planet. 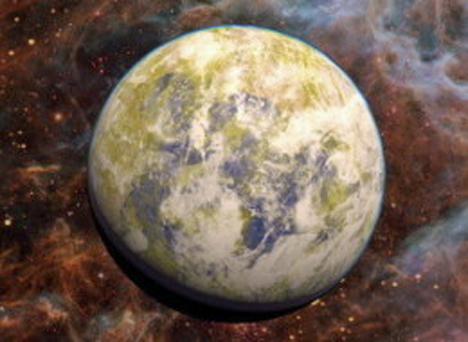 Scientists postulated that the planet, which exists in the “Goldilocks Zone,” or the area just the right distance from the planet’s sun to support liquid water and, presumably, life, may already be home to some type of life. Since that discovery, the very existence of Gliese 581g has been mired in controversy and the scientific community can’t seem to agree on whether it even exists. That may not matter now anyway, since they’ve found a planet even closer to us and with equally intriguing stats. Gliese 832c is a hop, skip, and jump away from Earth – on the grand scale of space – at just 16 light years away. 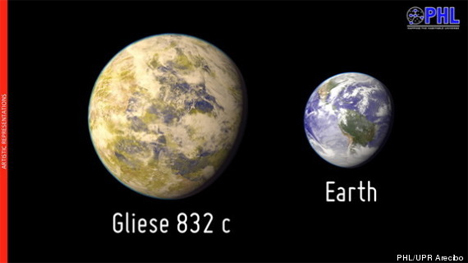 Gliese 832c is roughly five times the size of Earth and boasts a short 36-day year. Despite its close proximity to its star, the planet isn’t a fiery mass because its star is a red dwarf which is much cooler and dimmer than our Sun. This means that the newly-found planet receives just about as much energy from its star as our own planet does. Scientists don’t hold much hope for Gliese 832c being humankind’s first extraterrestrial home, however. Due to its mass, it is likely to have a super-thick atmosphere that creates a life-crushing greenhouse effect. Still, the director of the Planetary Habitability Laboratory at the University of Puerto Rico at Arecibo places Gliese 832c as one of the three most Earth-like exoplanets discovered to date, and the lab plans to conduct plenty more observation of the planet. See more in Space & Time or under Science. July, 2014.